1---This high-quality Dog Safety Vest Harness is designed to restrain the dog to one position in a car and prevent driver distraction. Fully-padded vest with breathable liner provides superior comfort and safety. It can also be used as regular harness for controlling and soft walking. 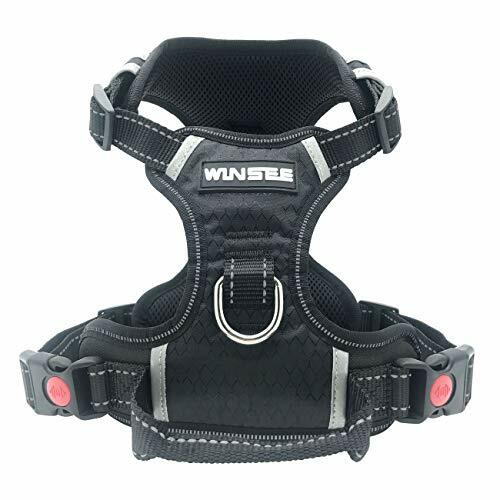 2---Locking Feature on Both Snaps Makes it Much More Safety,Perfectly for Daily Walking, Running, Hiking,Training, Hunting, Outdoor Adventure and So On.There are 2 Buttons on the Harness Strap Can be Easily Adjusted to make Your Dogs Feel Comfortable. 3---Your right of use will be long enough because it's really well built! 1---SOFT & COMFORTABLE: Make your pet's ride in the car enjoyable and safer. Fits most cars. 2--- JUSTABLE FOR CONVENIENCE: Adjusted easily, allow for easy entry and ensure a perfect fit! 3---X-STYLE STRUCTURE: Free your pets from the unpleasant feelings. More safe and more comfortable. 4--- BUCKLE UP YOUR PUPS : Keeps your pets safe in case of a sudden stop, and keep them from distracting you when driving. 5--- WALK THE DOG WITH EASE: This pet safety seat belt can be also used as a leading leash with leading leash (Not included) going through the D-ring. SAFETY AND HIGH QUALITY: Premium Material Makes dog vest harness Durable and Anti-Corrosion ,with Sturdy D-ring Leash Attachment Point and Soft Leather Carry Handle to Help You to Control and Assist Your Dog. REFLECTIVE STRAPS: Reflective 3M Visibility Strap pet vest ,Keep Your Pets Safe all the Time While Out for a Walk Even at Night. If you have any questions about this product by WINSEE, contact us by completing and submitting the form below. If you are looking for a specif part number, please include it with your message.